Zelda Fitzgerald’s only novel, Save Me The Waltz (1932) was written in six weeks after her admission to a sanatorium. It covers the period of her life that her husband F Scott Fitzgerald had been drawing on for years while writing Tender is the Night (1934). Fitzgerald revised her novel under her husband’s guidance, and died in 1948. Save Me The Waltz is now recognised as a classic novel of the woman’s experience in fast-moving Jazz Age American society. Watch the YouTube clip about the novel’s background in the ballet, why it annoyed F Scott Fitzgerald so much, and the problem with Zelda’s French. The novel opens during the First World War. Alabama Beggs is a Southern belle who makes her début into adulthood with wild parties, dancing and drinking, and flirting with the young officers posted to her home town. When the artist Lieutenant David Knight arrives to join her line of suitors, Alabama marries him. Their life in New York, Paris and the South of France closely mirrors the Fitzgeralds’ own life and their prominent socialising in the 1920s and 1930s as part of what was later called the Lost Generation. Like Zelda, Alabama is an aspiring dancer. She is committed to her dance training, attending ballet classes in Paris every day, but she refuses to accept that she might not become the great dancer that she ardently longs to be, and this threatens her mental health and her marriage. Erin Templeton’s introduction to Zelda Fitzgerald’s finest literary work discusses how these struggles to become a dancer were the result of Zelda’s need to have a life of her own rather than living in her husband’s shadow. All our books sold through this website are accompanied on their journey to you by bespoke bookmarks illustrating your book plus one other title to interest you. Your books are packed in tissue paper, sturdy paper packaging, and secured with remarkably strong non-plastic tape. We love packing as well as publishing. 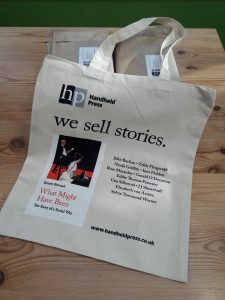 Every order of two or more books (any combination of titles) will receive one of our free tote bags, in organic fair trade cotton, hand-printed in the UK. You can pay by Visa or PayPal by clicking on the ‘Add to Basket’ buttons below (no PayPal account necessary). £12.99, includes free post & packing to addresses within the UK (BFPO included). £18 inclusive of post and packing for the rest of the world. The Kindle edition is available here, for £2.99 (or click here for the US site). Our epub edition is available from Kobo.